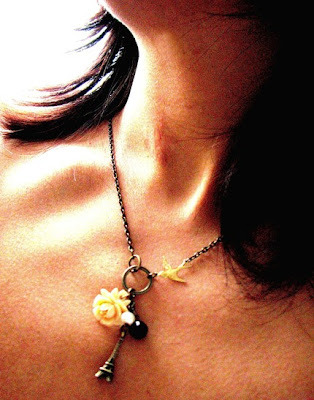 I love how whimsical this Poetic Designs necklace is. It is simple and chic and would add a bit of fun and whimsy to a casual look. Anything with an Eiffel Tower on it definitely gets my attention. There is something so romantic and dreamy about Paris. I hope to make it to Paris one day...soon. I love the mixture of charms hanging from the bottom and the bird holding it together. This is definitely a good way to add some fun to your look. I would wear this with jeans and a tee for a casual look. I think it's really nice, I agree on the bird - very unique. incredible piece of jewelry. love it! It's really chic. I love the flower. I need to go to Paris so I can wear it and not feel like a poser, haha. Tomorrow is the very last day to enter my custom elastic waistband skirt giveaway! That's gorgeous! I love it. Just bought an Eiffel tower brooch.. too cute. I'd love to travel to Paris too. The necklace is different with the bird, although too expensive it would be great to copy. yes I love anything with eiffel tower as well! beautiful necklace! Simply gorgeous! I love and adore it! Very pretty- I especially like the bird. Not a bad price either! Although, Paris is so amazing, I think we should all go and buy necklaces THERE. Girl of the Blogosphere: Melanie M.